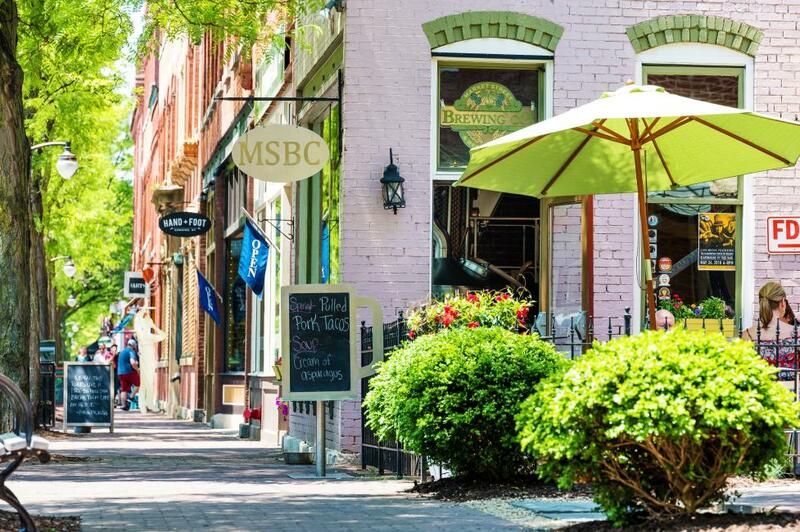 Stroll the antique shops, galleries, and boutiques on and around Market Street before sitting down to dinner. 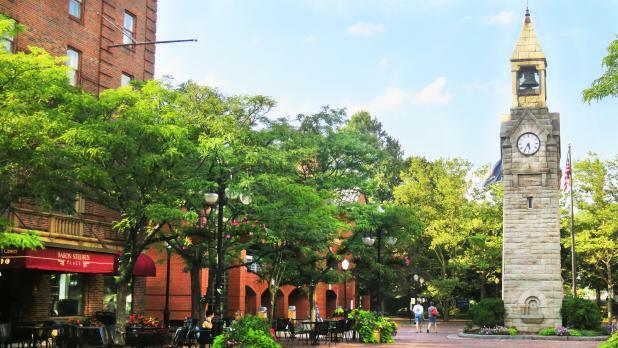 For a good view, walk behind the iconic clock tower to visit Centennial Park and to cross the Chemung River. This town’s not only about the glass—it’s also about the chocolate, and there’s even a Chocolate Trail to travel. More than 30 establishments have gotten in on the cocoa craze and offer items and experiences like the less traditional “all-natural aged dark chocolate balsamic vinegar” (Crystal City Olive Oil) and a “cocoa butter massage” (Four Feathers Massage) as well as “chocolate pate” (Three Birds Restaurant) and “Nutter Butter peanut butter chocolate ribbon pie” (Donna’s Restaurant), to fulfill your cravings. 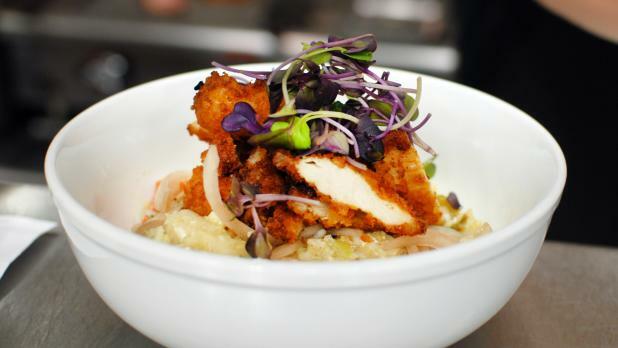 Make the Cellar your next stop for dinner. 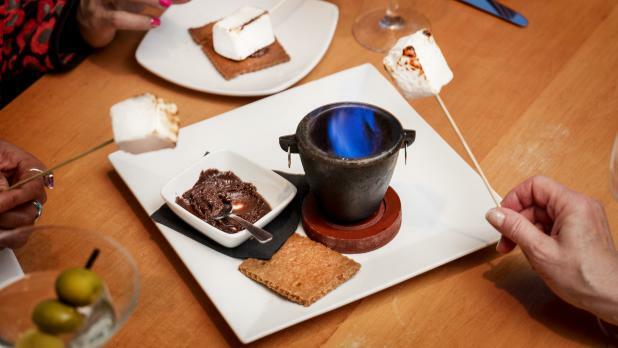 It offers “modern fusion” dishes made in-house with locally sourced ingredients (even down to the graham crackers for s’mores!). Everyone in your crew will find something to enjoy as the menu features a variety of global cuisines—tapas like bulgogi, hummus, pad thai, and poutine, and entrees ranging from enchiladas to a fish fry. At first glance, it may seem like the menu is all over the place, but the Cellar executes the dishes with surprising fluency and even has plenty of options for gluten-free, vegetarian, and vegan diners. Pair with your choice of more than 40 wines by the glass, including many from Finger Lakes wineries, or martinis. 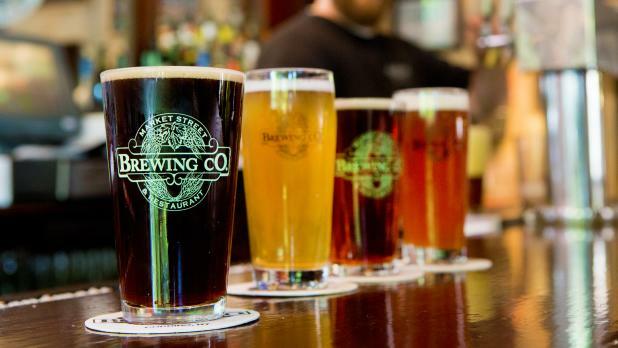 You won’t find a wild nightlife scene in Corning, but there are some great spots for cocktails and local beers. Liquid Shoes Brewing, run by two brothers with the last name Shoemaker, has fun rotating small-batch offerings like “Wanna Peach of This” peach blonde and “Olga the Destroyer” double IPA. It’s a cozy spot to settle in and chat with the locals and the brewmasters themselves. 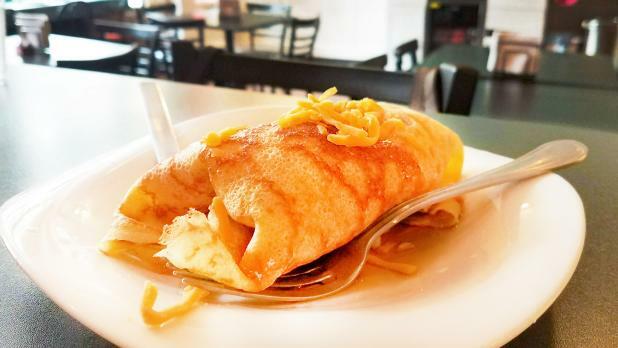 Start your day off right with breakfast at Poppleton Bakery on Market Street, where you can find paninis, wraps, and oatmeal, as well as a menu of crepes, such as hummus, fig, and bourbon, or the bacon, egg, and cheese with maple syrup drizzled on top (pictured). 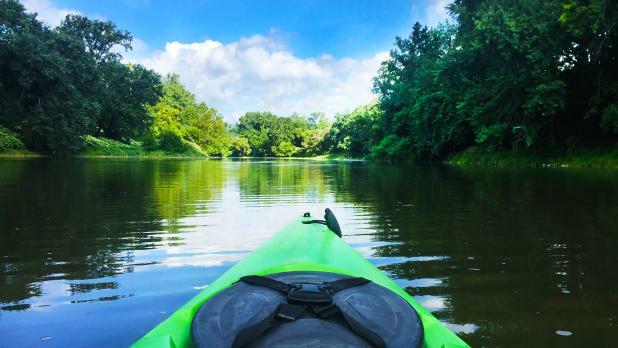 Take the “Paddle the Palisades” tour with Southern Tier Kayak Tours along the Chemung River between Corning and the nearby town of Elmira. Get a quick paddling lesson before heading on your way with an expert guide. On the tour, learn the geological history of the Chemung area and all about the wildlife, even looking for organisms under the rocks during a midway break. You may even spot a few bald eagles if you’re lucky. Seasonal, schedule in advance. Head back into the Gaffer District for lunch at Sorge’s Restaurant, opened in 1951 by two brothers who came to the US from Italy. Expect Italian-American classics like homemade pasta, fried calamari, and chicken and eggplant parm, as well as a variety of burgers, sandwiches, and salads. Gluten-free options are available. You probably don’t think much about the glass objects you see or use day in and day out, like the glass you sip orange juice from, or the windows in your home, or the screen on your smartphone. 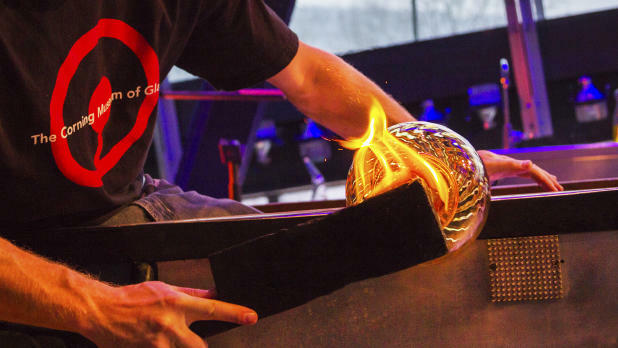 Gain a whole new perspective and start to see it as a science and an art form after visiting the Corning Museum of Glass—which, by the way, won second place in the 2019 I LOVE NY Bracket. The green spindly Dale Chihuly sculpture in the lobby is just the beginning. Spend hours exploring as you learn about 35 centuries of the history of glass, including a pendant from Northern Mesopotamia from around 1500 BC(! ), a mosaic bowl from the year 800, and modern large-scale artworks that will totally change how you feel about a material you interact with every day. Watch expert gaffers perform a hot glass demo. The glass is melted at temperatures higher than 2000 degrees Fahrenheit and blown, pulled, and pressed into gorgeous shapes right before your eyes. With cameras at the workstations and in the ovens, you’ll get an even greater appreciation for the form as you observe the whole process. Now it’s your chance to get in on the action! 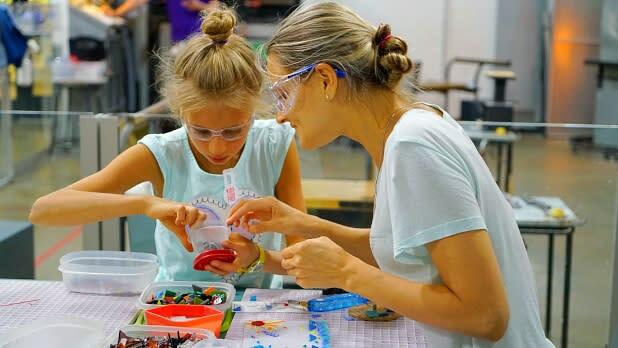 Corning’s “Make Your Own Glass” experiences allow visitors to try their hands at flameworking, fusing, glassblowing, glass-forming, and sandblasting. You&apos;ll get to take the colorful beads, picture frames, vases, flowers, wind chimes, and more as souvenirs of your visit. Seasonal offerings include eggs, pumpkins, and ornaments. Advanced reservations are recommended. Also in the area is Dr. Konstantin Frank, New York’s most award-winning winery. 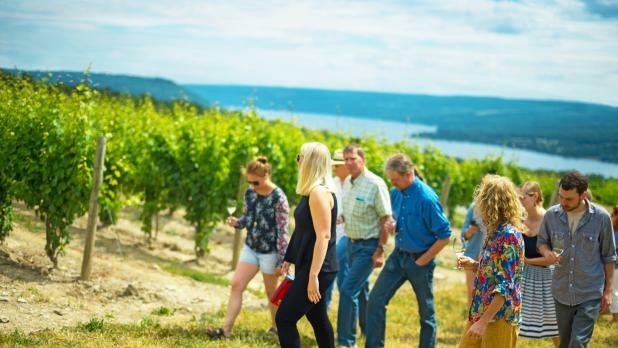 Dr. Frank said “hold my wine” to the nay-sayers who told him he couldn’t grow Vitis Vinifera, European vines, in the Finger Lakes, jumpstarting the “Vinifera Revolution” and altering the course of grape-growing in the region and in the country. You’ll find coffee, tea, bagels, and pastries at Soul Full Cup. The folks here take pride in crafting their coffee thoughtfully, roasting everything on site in small batches, and sourcing 100% of coffee beans from the fair-trade market. Use your combo ticket from Saturday to either get some more time in at Corning Museum of Glass or discover the treasures at the Rockwell Museum, where you’re invited to “experience the people, land, and ideas that shaped America.” The museum focuses on Native American art and works that highlight the journey westward into America during the times of Manifest Destiny. The collection includes sprawling landscapes that make you feel like you’re standing outside in front of the mountains depicted, wildlife lithographs by Audubon himself, paintings and sculpture by Charles Russell—aka “The Cowboy Artist,” and impressive bronze sculptures by Frederic Remington. 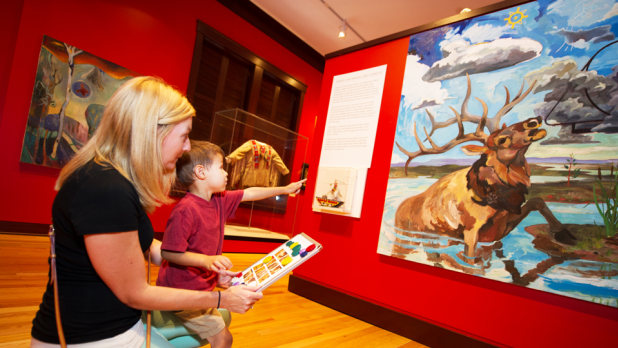 Children’s programs at the museum include art scavenger hunts, I-Spy, and touch stations. At the KIDS ROCKWELL Art Lab around the corner from the museum, kids can make puppets, play in a cardboard village, draw portraits, and create miniature versions of pieces of art at the Rockwell Museum. As you’ve been exploring Corning, you may have wondered about the beautiful murals you’ve seen on buildings around the area. Delightfully, these pieces were designed and painted by local high school students as part of the Alley Art Project with the Rockwell Museum. The students also study art theory and symbolism at the museum with a professional artist. Cap off your weekend in Corning with one more stop along the Chocolate Trail. Of course, this ice cream place offers more than just chocolate in its rotating flavors, and that includes beer ice cream (made with local stout), sorbets (sometimes made with local wine), and vegan options.